When we strip away everything we own, what is left? When we have nothing to do, nothing to look at, no distractions? We have our own thoughts. And as anyone who’s been awake at 3:30am before will know, our thoughts can often be incredibly unwelcome. Experimenting with quiet, with no devices, screens, stuff or sounds to distract me, my mind starts to wander into dangerous territory. I start worrying about things I should have done but haven’t. I worry about my children, my parenting skills, my work skills, my unfulfilled goals, my clients, my marriage, my health, my appearance. I think of the times I spoke tactlessly before thinking, or re-live those times I was humiliated in public or bullied at high school. You name it, it will pop up. I want to run away from those thoughts. I want to hide from them with Instagram or a word game. With Netflix or chocolate. With going through my stationery draw and reorganising it. With buying a new pair of shoes. With reading a blog. What if you consider the idea that you might be collecting or keeping stuff to protect you from these worries – that you may busy yourself shopping, tidying or organising so that you aren’t alone with your thoughts? What if you consider the idea that you fill your schedule with busy-ness, spend time staring at your phone and volunteer to do stuff for others, so that you aren’t worrying about your life? I don’t have the antidote to worrying – I’m doing it myself and am wondering how to turn it off. But I do know that hiding from it doesn’t help. The thoughts are still there, no matter what we do to try to cover them up. Maybe, if we strip everything away and we sit with all that remains, we can find another way to quiet our mind that doesn’t involve running away from it. Some people struggle to declutter because they need context. Without it, they feel they can’t let go. By context I mean that someone is decluttering their study and they find an egg-flip. The person doesn’t know if they have any other egg-flips, or how many they have, so they can’t make a decision to discard that egg-flip. They keep it, and then weeks later have the same dilemma when they find another egg-flip somewhere else. Was it the same one? Do I only have one? Or do I h…ave more, and can I safely donate this one? Usually the uncertainty is too high so they choose to keep it. There is one obvious solution to this – declutter by category. Grab all your egg-flips, put them in one place and then declutter. Marie Kondo has borrowed this method for her book and it can be very helpful. Unfortunately, it’s only helpful for people with low-to-medium levels of clutter or for relatively organised homes (ie, all your items are contained to one to three rooms per category, like clothes or toys). It’s completely useless for people with high or hoarding levels. I mean, how on earth do you find all of your batteries in the whole house when you can’t even open the cupboards or see the floor? So my poor clients are stuck between a rock and a hard place. They can’t discard because they fear discarding too many or the wrong ones, and they can’t find the rest to help facilitate the decision-making. The solution I recommend (understanding how hard it is) is to just forget the context. Forget the others, forget the maybes, just declutter as much as you possibly can, knowing that if you make a mistake, you’ll still be okay and your main goal of being in control of your belongings is more important than trying to avoid having to buy a $3 egg-flip from KMart. That’s the key – knowing you’ll still be okay no matter what choice you make. Because you will, I promise. I am enough. I don’t need stuff to define me. I have enough. I am blessed with all I have. If I make a mistake and cull something I regret, I’ll still be okay. People are more important than stuff. Culling is not wasteful. Keeping things without using them is wasteful. I’ll be okay. Everything will be okay, no matter what I do. These are useful things to remind yourself of when you’re trying to reduce your belonging and finding it a bit difficult. When you’re trying to get your life under control it’s very important not to compare yourself with others. Especially with others on social media. There’s so much “perfection” out there. On Pinterest, Instagram and Facebook. It’s easy to get sucked into the idea that your life would be better if you looked like them, or your house did. If you could afford new furnishings or a Professional Organiser, if you could take the kids to interesting places every weekend and everyone smiled and looked like the perfect family. You can’t see the struggles behind that “perfection” but don’t assume they aren’t there. Don’t assume that the picture of the perfect living room wasn’t taken by a woman in tears whose teenage daughter had just ripped shreds off her, or by a person in severe debt that kept them awake all night worrying. You don’t see the tantrums, the fights, the tension. You don’t see the anxiety, the throwing things and the coldness. You don’t see the overdue bills, the migraines, the depression. And that’s fine – no one likes to show off the ugly and unhappy sides of life that inevitably affect all of us, no matter who, no matter how. No one wants to see it all the time, either. But what’s not okay is to let yourself be dissatisfied with your life because you want it to be perfect. 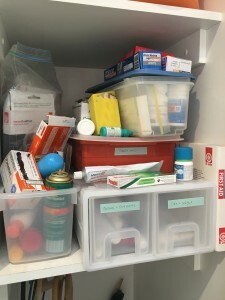 You can have a perfectly organised pantry with all glass containers full of organic whatever and you will still just hide in it and sob as you eat chocolate while the toddler screams blue murder for cutting their toast in squares instead of triangles, despite asking for squares in the first place. A perfect home does not equal a perfect life. You’ll still have life’s struggles, you’ll just be doing it all in white with pastel, hanging planters and elk horns, with a toddler in a hand-knitted outfit. A home under control does help you and that should be what you’re aiming for. Just make sure it’s YOUR version of “under control”, not Instagram’s. I was with a client recently and I was holding a catalogue that she asked me to toss in the recycling. I looked down as I tossed it in the bin and I saw a product on the back and my first thought was “Oh! That looks handy!” and started to think about where I’d put it and who’d use it in the house and where. My next thought, thankfully, was “For goodness sake, Rebecca, you don’t need a jigsaw-puzzle mat”. But still, I was sucked into creating a need in my mind based on seeing a picture of something. I didn’t need nor want a jigsaw mat until I saw it. Sucked in, Mezzino! 1) Home shopping networks and catalogues – the culprit that got me. There’s one here in Australia that is particularly enticing because it has clever gadgets that spark your imagination. The issue is that they are very specific products, made for narrow purposes, which means you have a lot of products doing just one thing each. There are common things like avocado slicers (which slice nothing but an avocado) or garlic crushers (again, just for garlic) or more unusual items like an egg cuber (makes a square egg, of course). They create need where there is no real need (got a knife? There’s your avo slicer and garlic crusher in one!). 2) Sales. 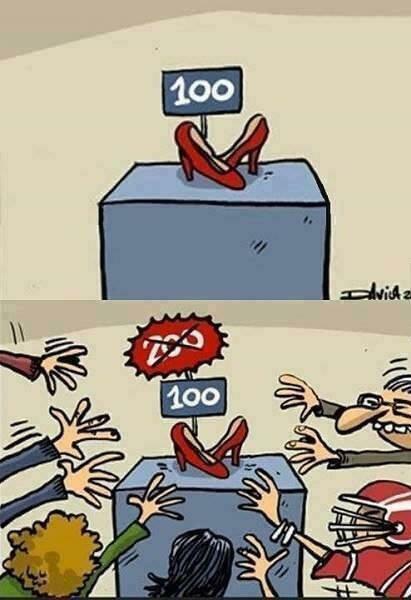 Marketers know very well that when we shop we buy stuff based on emotion and we justify the purchase with logic (after the fact most of the time). And when we shop in sales, the weight of emotion is stronger. We get a kick out of getting something for nothing. For getting something for less than what someone else may have paid. Then after the purchase, there’s more logic to back up the decision – “But I got $200 shoes for only $100!”. Nope. Discounts are not a real thing. They are something that masks the fact that you spent $100 on something you probably didn’t need. Something you won’t really use and will eventually have to discard (which can hurt for some). So you didn’t save $100, you wasted $100. Of course, you can buy stuff on sale, and you can save money, but only if you intended to buy that item before you saw it, and you were prepared to pay full price. That’s the only time you actually save money on a sale. 3) Charity auctions. You can accidentally spend money on things you don’t need because you can justify it by the thought that the money is going somewhere good, or that you were going to buy something like that anyway. Be careful; if you have clutter issues, it’s best you just make a donation. 4) “Clubs”, party plan and purchasing schemes. I had a client that was part of a scrap-booking group. There were three tiers to membership, each involving a compulsory purchase of materials each month. She felt like she’d be letting down the organiser if she dropped down a tier or two, but didn’t want the stuff and it was literally filling up her house. 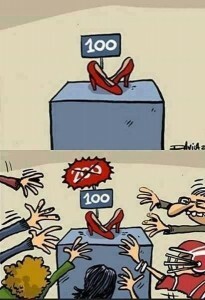 Any time you’re required to make a purchase in order to fulfil a commitment, run away! 5) Shopping as entertainment. When you shop for the fun of it, you are more likely to impulse-purchase. You are more likely to buy things just because they’re on sale or cheap, or they’re pretty. Shopping is a helpful activity when it’s done mindfully – when you know what you want and you don’t buy anything that’s not on your list (mental or otherwise – I always have a mental list of things I need, and sometimes write a specific one for that particular shopping excursion). If you deviate from the list, you’re probably collecting clutter. 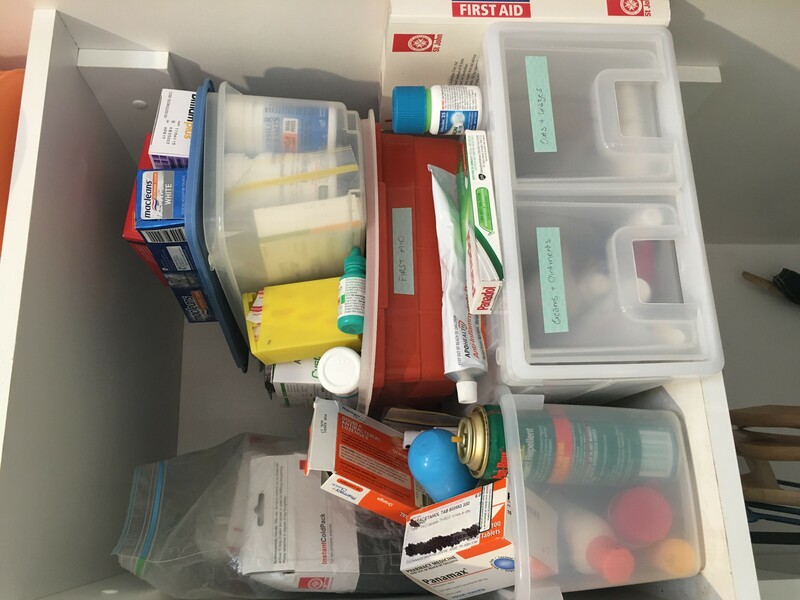 Do you know of any other sneaky clutter-enablers? Okay, I made that title up. But it isn’t too far from reality! Most people get a sense of euphoria after decluttering. Some, however, do not. In fact, they feel horrible. They are anxious and miserable, dwelling on decisions made and wondering if they made mistakes. If you’re one of those people, you may be wondering why you don’t get as excited by the results as others do. 1) Attachment happens in your mind. Physically removing something does just that; it’s physically gone. If you are still attached in your mind, the fact that it’s gone is not a relief. 2) You haven’t trained your brain to stop panicking yet. Every time our brain gets a reinforcement, it is told to continue that behaviour. So when you try to throw something away, then panic, then keep the item to make the panic go away, you’re telling your brain that panic is the appropriate response when attempting to discard something. 3) The future is more unknown with less stuff. No longer can you safely predict what might happen (ie right now you can predict you will have 2 spare can-openers to grab should you lose your favourite one). Instead, if you only have one can opener, you can’t predict the outcome of losing or breaking it. Unknown stuff can be scary if we allow ourselves to think of the negative consequences. 4) You worry that you’ve made a mistake. Your brain predicts a total catastrophe should it become apparent you’ve thrown out something that later becomes needed. This fear of the catastrophe has you dwelling on what mistakes you may have made when culling. 5) You feel you are losing a part of your identity or your past. Your past and your stuff are related. We store patterns in our neo-cortex of things we see, hear, smell and feel. Our brain cross-references these patterns and therefore creates an association. If you part with one of those “pointers” and it’s outside of your control and exists only in your mind, perhaps you’ll end up with memories in your brain that can’t ever be retrieved again. 6) You’re grieving lost opportunities. There are now things you may never see again, do again, think about again. 7) You did it for someone else. When you declutter to keep someone else happy, you’re less likely to enjoy the results. It’s not unlikely, just a little less likely. 8) You’ve forgotten about your goals. You’re thinking about what you’ve “lost”, not what you’ve gained. You have either not focused on your goals, or you have forgotten about them. 9) You just love your stuff too much. Whether you have hoarding disorder, or another mental health condition that fosters a very strong bond with physical belongings, your brain simply won’t let you let go. This is why there is so much more to decluttering than just getting rid of stuff. It actually requires changes in mindset that without them, you won’t be able to be completely happy with the result. Declutter your fears first, then your stuff. How many “tabs” do you have open in your life? You know when you’re working on your PC and you have a browser open, and you keep jumping from one thing to another without finishing? You end up with lots of browser tabs open, don’t you? It gets cluttered, confusing, you miss where you were up to on things and you don’t actually finish anything properly. Well your life is very much like an internet browser. When we juggle too many things we also miss stuff, feel lost and overwhelmed and don’t finish anything. How many “tabs” do you have open in your life? What can you close?